Apple Responsible for Gender-Based Discrimination? Apple lore extends back at least to the beginning of the biblical narrative, though mistakenly so. In the biblical narrative, the Hebrew god created a world for his first proto-couple. He carved out a special spot in the newly formed worlds and made it into a garden and called it Eden. He planted two trees in the Garden of Eden. The first was the Tree of Life and the second was the Tree of the Knowledge Between Good and Evil. God told the proto-couple that all vegetation in the Garden was available for food except for the fruit from the Tree of the Knowledge Between Good and Evil. 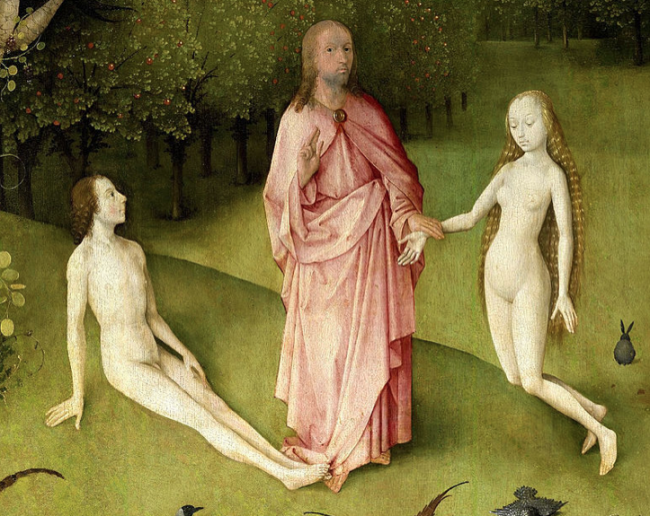 There was no gender-based discrimination because Adam and Eve were equals and only responsible for communing with God and each other, enjoying the garden, and not eating fruit from the forbidden tree. Eve, it is said, was beguiled by a beautiful serpent who awakened in her an inquisitive and impudent nature. The serpent, so it goes, suggested that eating the fruit of the Tree of the Knowledge Between Good and Evil would awaken in Eve great abilities, and it promised that she would be like God. Eve ate the fruit. Adam ate the fruit. Whereas before, both of them had been blissfully unaware of the nakedness, they now simultaneously realized that they were naked. They reached out and grabbed fig leaves to cover themselves. At this point in the narrative, the idea that the forbidden fruit was an apple breaks down because apple trees do not produce fig leaves. Identification of the specific type of fruit that the couple ate, however, might not be as important as the influence that the story has had upon Western civilization. That story of the garden ends when the new duo gets evicted and cursed by God just before being given the promise of a future redeemer. God decrees that women will have painful childbirth, will be subservient to their husbands, and will have an everlasting, natural aversion to snakes. Adam, on the other hand, is doomed to a life of hard work, nominally productive land, and scarce provision. Various interpretations of this interchange exist in the circles of both ardent Bible literalists and more symbolic interpreters of the stories of the ancients. The first group points to the modern world with a checklist in hand and sees clear evidence that the results of the curse are extant. The second takes a more symbolic view on the story and sees similarities with other cultures’ hero story archetypes. Historian and mythologist, Joseph Campbell, provided the foundation for this second group. Campbell’s Hero With a Thousand Faces series compares the myths of the ancients around the world and finds themes uniting them all. Interpretations based on Joseph Campbell’s symbolism would recognize a classic hero tale in the story of Adam and Eve. The story begins in a peaceful place and then an abrupt event disrupts the peace. The hero is sent away from his known life and his support system, and he is thrust in to the wide, harsh world to find his way. He must overcome the challenge for which he does not feel prepared, and he will be deeply tested before being allowed to return to a place of ease. Post journey, however, he have a higher understanding and wisdom to share with the community to whom he returns. Whatever the interpretation a person has, it is indisputable that the story of Adam and Eve has had enormous influence in Western society. A harsh misreading and blatant misapplication of biblical principles expressed in the apple in the Garden of Eden story has the potential be responsible for a justification for gender-based discrimination and violence against women. Who would not be mad at the person who caused a life of hard work and toil? The concept of marriage and traditional gender-based roles tie back to the curse when Eve was told she would be ever-after subject to her husband. The belief of some people who suffering is a consequence of the sin that Eve allegedly passed down to all of humanity can lead to people accepting as outside of their control circumstances that could otherwise be proactively addressed and improved upon. The underlying belief that people are born with sin can be used to justify tragic behavior, blaming the extremely harmful and hateful behavior on the influence of an external adversary instead of assuming personal responsibility. Opinions about Bible interpretation are as varied as people who read the book. Whether or not an apple is responsible for gender-based discrimination, the fact remains that the misinterpreted story of the apple has had a profound influence on shaping societal norms. One Response to "Apple Responsible for Gender-Based Discrimination?" Who says the fruit was an apple?? The bible doesn’t say that. but then again, there is a point there. it is because they ate the forbidden fruit that mankind was cursed. but I believe everything happens for a reason. as much as some may disagree, I think this ‘hierarchy’ works. God didn’t say woman don’t have to to work, man did. God didn’t say men cannot help out at home, man did. i mean, today that has changed. some men are stay at home dads while their wives go to work… Fact is, no woman will respect a man who cannot provide for his family, even if she could do it on her own.